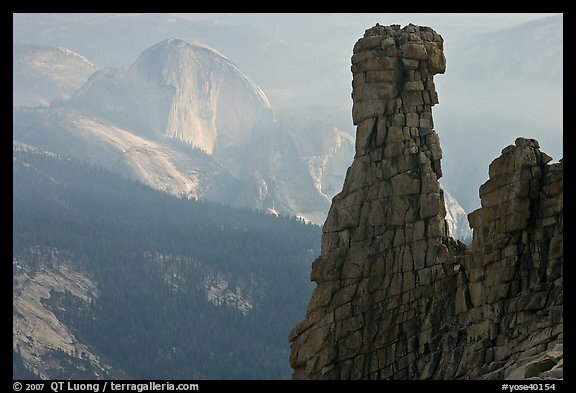 Mount Hoffman (10,845 feet, 3,305 meters) is right in the center of Yosemite. For a (relatively) easy to access viewpoint which gives you spectacular bird-eye’s views of the Yosemite backcountry in all directions, it is hard to top this hike. 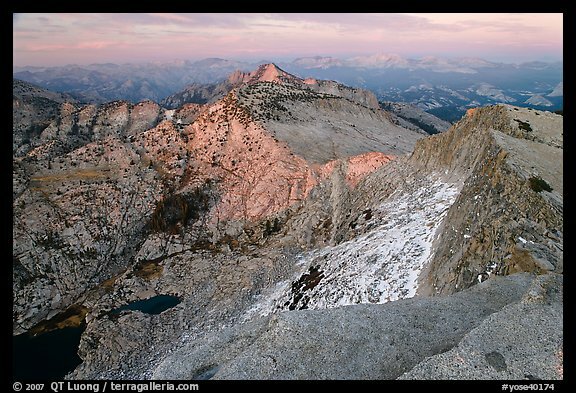 If you do only one high-country summit hike in Yosemite, I would suggest this one. The hike is accessible whenever Tioga Pass Road is open, although there may be too much snow in the spring. 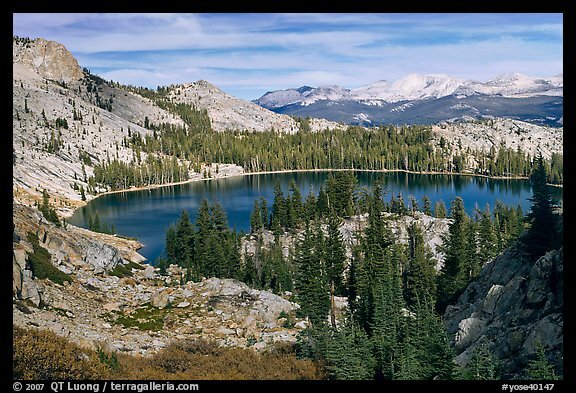 On Tioga Pass Road, about 28 miles from Crane Flat, there is a small spur road marked “May Lake”, which is easy to miss (we did). 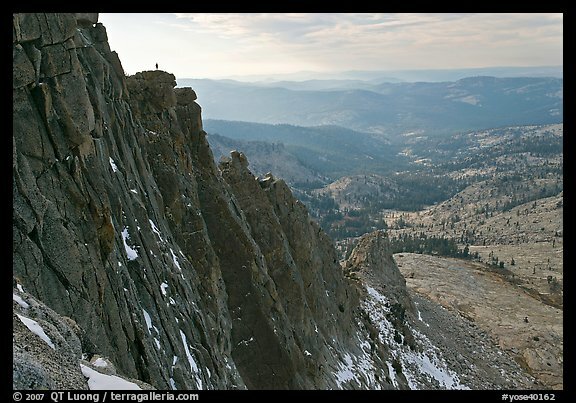 Since I planned to hang out on the summit until sunset, Tom (Yosemite Explorer) and I did not get an early start. Moreover, I noticed nice clouds in the Valley in late morning, so we stopped for this photograph from Gates of the Valley. Since we hit the trailhead well after lunchtime, anticipating few photo stops besides the summit, I had repacked my large format camera in a lighter and more comfortable mountaineering backpack, along with the digital gear (EOS 1Ds mk 2 and 3 lenses). Tom had brought only a tiny day pack, so all I could give him were my 3 large format lenses. 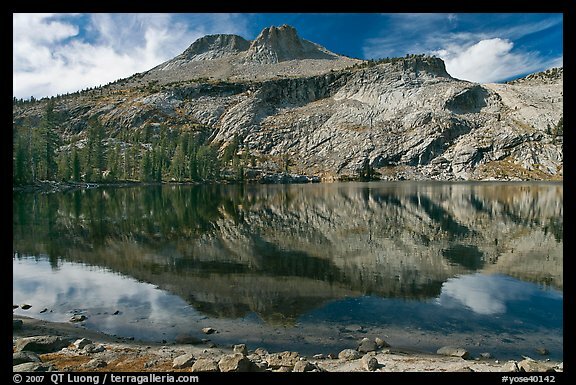 One of the Yosemite High Sierra camps sits on the shore of May Lake, itself a nice sight, only about 1.25 miles from the trailhead, with less than 500 feet uphill. This area is quite busy in summer, so why is that included in a “Yosemite Unseen” series ? Besides the fact that only 5% of visitors venture outside of Yosemite Valley, right at this time of the year – beginning of November, when the Valley experiences the peak of fall foliage color – even the May Lake shore was empty. We did not meet a single party on that afternoon. Although the summit got a bit chilly around sunset, the temperatures were just perfect for hiking uphill. Above the lake, as the trail became more steep, gaining 2000 feet in the remaining 4 miles to the summit, nice views opened up over May Lake. 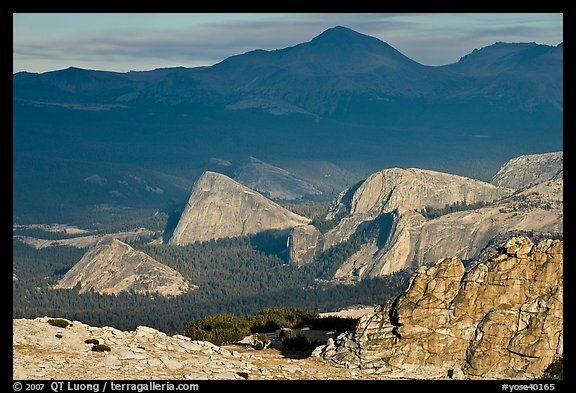 Further up the trail, looking South, Half-Dome was seen from an unusual angle. Unfortunately, although autumn atmosphere is normally very clear, the clouds that helped create great light in the Valley caused a lot of haze in that direction. After scrambling on blocks past the end of the trail, we reached the summit. The view over sheer cliffs on the other side was vertiginous. I asked Tom to stand on the rim to give a sense of scale, as I photographed towards the hazy West. 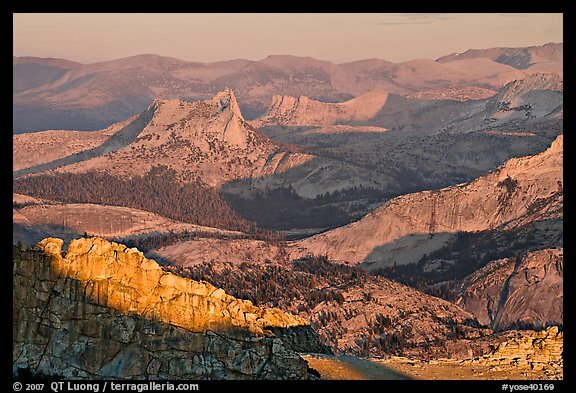 Looking towards the East, I could recognize all the typical rock domes surrounding the Tuolumne Meadows area. As sunset was getting closer, ridges in the East became more colored, however the foreground was in too deep of a shade on the North Side for a wide-angle view. As is often the case, the light softened at twilight. After a last exposure, we hastily climbed down the summit blocks, which would be tricky to navigate by dark. Posted on October 28, 2011, 3:37 pm, by QT Luong, under Location guides. Unbelievable! One Day I’d like to try this hike. I think I need to get back in shape.